You can even start the course on the same day! You can also do the course from the comfort of your our home! See our JK Laser Hair Therapy Cap page for more information. JK Laser Hair Therapy uses Low Level Laser Therapy (LLLT) to help you regrow your hair using a scientifically proven and FDA approved laser spectrum. The main culprit behind hair loss is Dihydrotestosterone (DHT). DHT causes inflammation of the hair follicles which causes hair follicles to miniaturise and eventually die leading to hair loss. JK Laser Hair Therapy breaks down, clears and removes DHT from the scalp. JK Laser Hair Therapy also prevents DHT from attaching to the hair follicle at all. This stops hair loss. JK Laser Hair Therapy combined with JK re-growth pharmaceuticals, combats hair loss from multiple fronts. Our state of the art Laser Hair Therapy machines emit the FDA approved and scientifically proven laser spectrum required for hair regrowth. Studies have shown the more lasers directed at the problem area, the faster the results. Many Laser Hair Therapy companies claim to use real lasers when in fact they are using LEDs which are not as effective at combating hair loss. Our Laser Hair Regrowth Therapy machines utilize a massive 400 real lasers, to give you the best results possible. Other Laser Hair Therapy companies offer laser hair therapy using old out of date machines with few lasers. This will not give you optimal results. Our machines incorporate leading edge technology and are the best and most effective laser machines for hair regrowth in Ireland and in the world! What are the benefits of JK Laser Hair Therapy? What research has been done on LLLT? Recently, low level laser therapy (LLLT) has proven successful in stimulating new hair growth in men who suffer with androgenetic alopecia, or pattern hair loss. In a clinical trial, participants saw a significant increase in the amount of hair on the scalp and overall there was a 95% success rate after using LLLT for just 26 weeks. LLLT increases blood supply to the scalp by 54% after only one treatment. Most men are shocked to learn that pattern hair loss is actually a chronic dermatologic disorder (of the skin). Leading research indicates that pattern baldness stems from hair follicle miniaturization, a phenomenon thought to be caused by hormonal imbalance and increase production of Dihydrotestosterone (DHT). This condition causes follicles to shrink over time, eventually becoming unable to sustain natural hair growth. Follicle miniaturization appears to be the most common cause of hair loss in men. 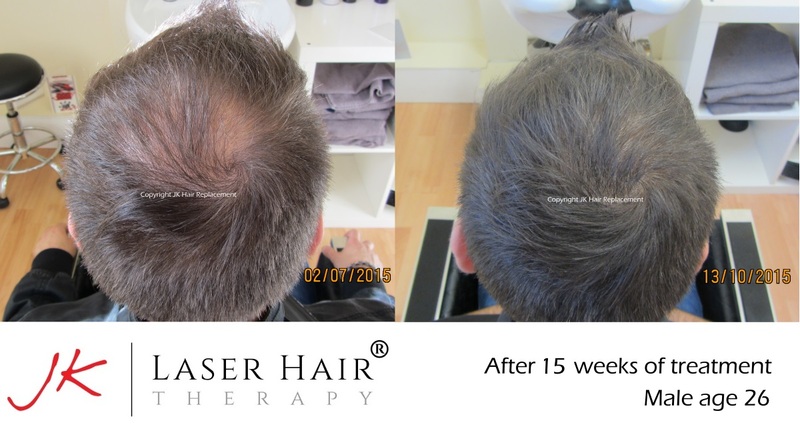 The most effective non-surgical hair loss treatments focus on slowing or reversing the miniaturization process. Most recently, low level laser therapy (LLLT) has received acclaim for their safe, non-surgical, and convenient approach to treating pattern baldness and other hair loss conditions. Our LLLT machine is designed to reawaken dormant or “miniaturized” hair follicles through photobiomodulation, a biological process that induces cellular activity, repair, and growth. LLLT will also stimulate and accelerate hair growth by reducing excessive levels of 5-alpha reductase (enzyme) and DHT. LLLT improves the biologic environment, by increasing blood and lymph microcirculation to the roots, removing blockages around the follicle, and energizing cells and the hair papillae to take in nutrients faster, allowing the hair to grow thicker and stronger. It increases blood supply to the scalp by 54% after only one treatment. Combining LLLT with re-growth pharmaceuticals, you will receive the best possible chance of stopping hair loss in its tracks and stimulating new hair growth. JK technology and our JK Laser Unit are set apart from other low level laser hair therapy systems with our unique laser dispersion technology. Jamie was unhappy with the way traditional Lasers for hair regrowth worked so he developed our unique laser dispersion technology in tandem with a leading Italian Laser Hair Specialist Company. Many other home laser and clinical laser systems utilize a ‘rifle’ effect of collimated beams (cent-sized spots that hit the scalp) whereas JK has revolutionized this technology and delivers laser energy to the scalp with a ‘shotgun’ approach. This approach ensures every part of the scalp surface receives laser energy at the base of the hair follicle 8 – 10mm deep. JK Laser Technology uses an open beam that utilises the optimal wavelength to reach the hair follicle. The laser beam is allowed to spread-out (‘shotgun’ approach) and soak the entire scalp continuously, during the complete time .of treatment, creating a uniform laser energy field and essentially one ‘giant laser beam’ that covers the entirety of the patient’s scalp. Using FDA approved laser beam spectrums’, our JK Laser unit has over 400 laser diodes. This is more than 5 times the average amount of lasers other clinic’s machines have. Each diode emits the maximum mW so that maximum results are achieved. JK Laser Technology attacks hair loss at a cellular level using Bio-Stimulation to energize weakened follicles. 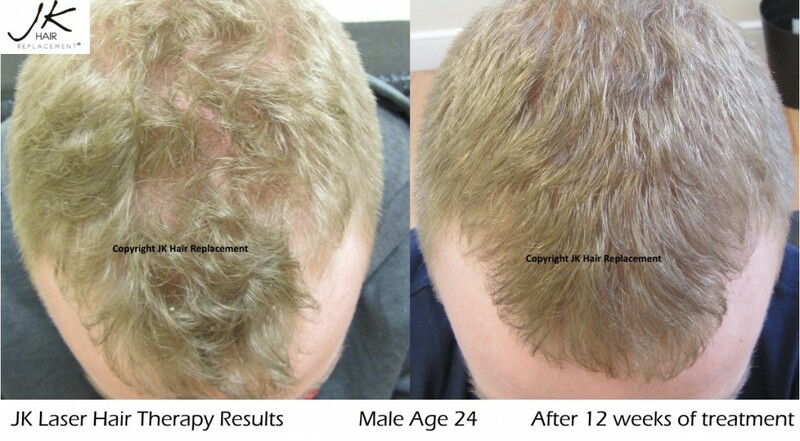 JK Laser can be used by both men and women for hair regrowth. It works by improving blood flow to the hair follicle by up to 54% after only one treatment. Improved blood microcirculation to the hair follicle increases the nutrients the hair follicle receives. It enhances the follicles ability to dispose of cellular waste and chemical by products. 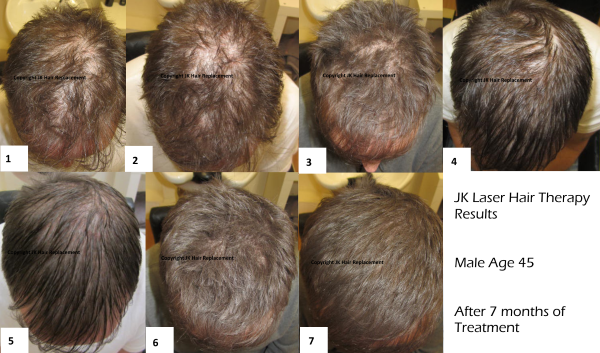 Results of JK Laser Hair Regrowth Therapy from Month 1 to Month 7. Note: In pictures 4 and 5 the hair is wet. This is to show the significant increase in hair volume. Using JK Laser before getting hair transplants prepares the scalp for receiving the hair transplants by improving the microbiological environment of the scalp at a cellular and physiological level. This massively increases the chance of success of the newly transplanted hair attaching and growing in the new location. Also, following the hair transplant, a course of JK Laser will also increase the success of the hair transplant so that there is less chance of the hair not taking to its new location. Also, the speed of healing and recovery following the hair transplant will be much faster. Another benefit, is that it is tackling the hair loss problem too preventing further hair loss and encouraging and stimulating natural hair growth unrelated to the hair transplant itself. Using JK Laser Hair Therapy pre and post transplantation procedures is very beneficial to those doing or considering surgical hair transplantation. We cover Laser Hair Therapy Dublin 1, Dublin 2, Dublin 3, Dublin 4, Dublin 5, Dublin 6, Dublin 6W, Dublin 7, Dublin 8, Dublin 9, Dublin 10, Dublin 11, Dublin 12, Dublin 13, Dublin 14, Dublin 15, Dublin 16, Dublin 18, Dublin 20, Dublin 22, Dublin 24 and County Dublin and throughout Ireland. Check out our Laser Regrowth Therapy Testimonials and find out what everyone is talking about in Ireland! We have helped and advised thousands of clients from every county including: Antrim, Armagh, Carlow, Cavan, Clare, Cork, Derry, Donegal, Down, Dublin, Fermanagh, Galway, Kerry, Kildare, Kilkenny, Laois, Leitrim, Limerick, Longford, Louth, Mayo, Meath, Monaghan, Offaly, Roscommon, Sligo, Tipperary, Tyrone, Waterford, Westmeath, Wexford and Wicklow.